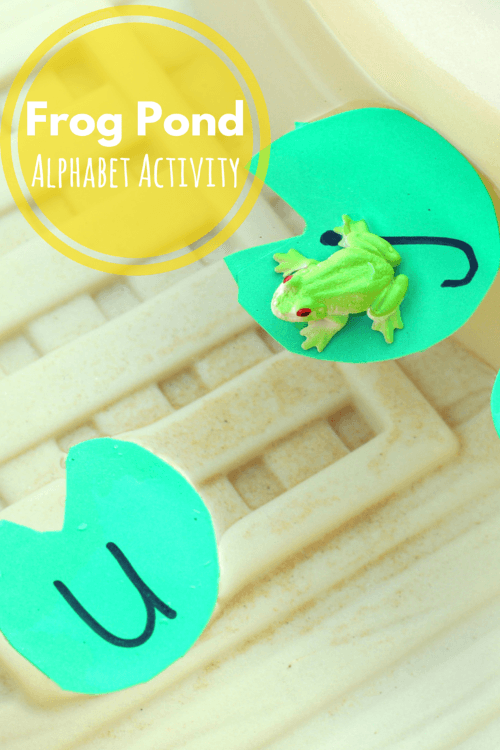 This frog pond alphabet activity is a super simple way to make learning fun and playful. 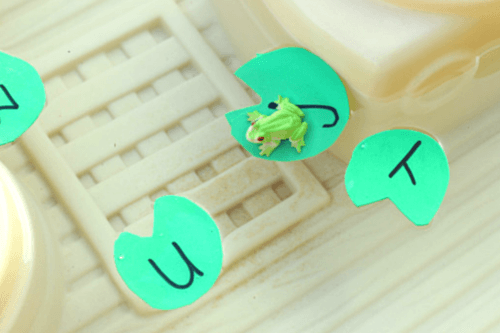 Children will learn letters while the frog hops on the alphabet lily pads. This week the PLAYful Preschool theme is the pond. 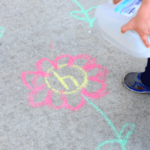 The team has planned pond theme learning activities that your kids are sure to enjoy! 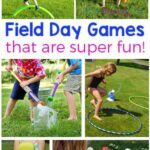 Check out all the posts below! 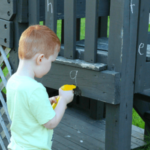 It is finally warm enough to play in the water table daily. My kids are so excited about that. 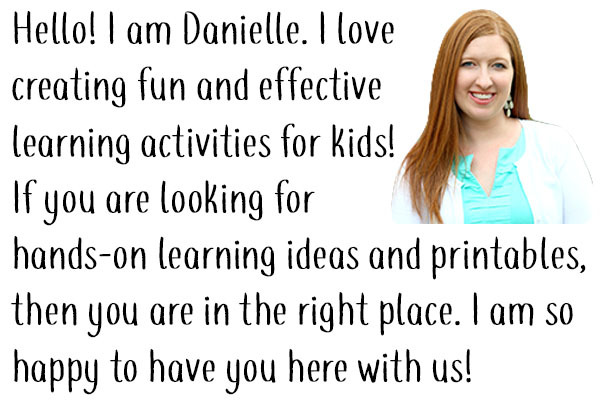 It also gives me the opportunity to do more outdoor learning activities. I am excited about that. 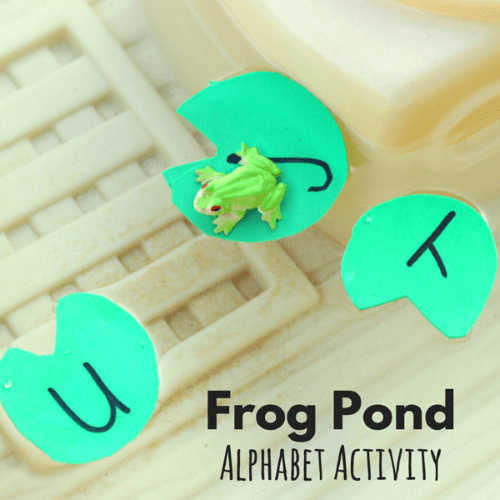 This frog pond alphabet activity was very easy to set up. I did it in about five minutes before heading outside to play. I had some craft foam from the dollar store and it was very thin and flimsy. It ended up being a bit too flimsy to hold our rather heavy frog. I ended up doubling up the lily pads. I wish I had used my higher quality foam sheets from the craft store. 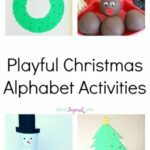 You may want to take that into consideration when making these. If you have a really lightweight frog, it may not be a problem. 1. 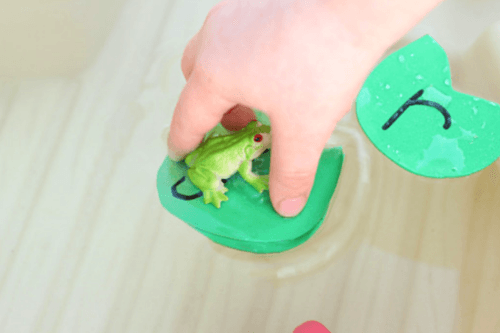 Take out a sheet of green craft foam and free hand some lily pads onto it with a pencil. I made ten lily pads. 2. Cut the lily pads out. 3. Write a letter on each lily pad. I laid the lily pads down on the water with the letters facing up. Then I left a frog on one of them and invited my son to play. There was no structure or plan. 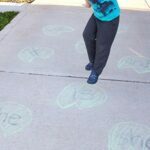 We just talked about each letter as he moved the frog around on them. Sometimes I would name the letter or he would. Other times I mentioned the sound the letter makes or a word that starts with that letter. It was very low-key, but lots of fun! 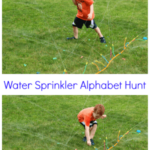 Stay tuned for more learning activities in the water table.